Here’s the latest sales report from Media Create (and Famitsu), covering Week 3, 2019 in Japan. Week 3 saw the release of a few games, but none of them are on a Nintendo platfoms. But despite that, there’s still a lot of Nintendo Switch games in the Top 20 provided by Media Create this week again. 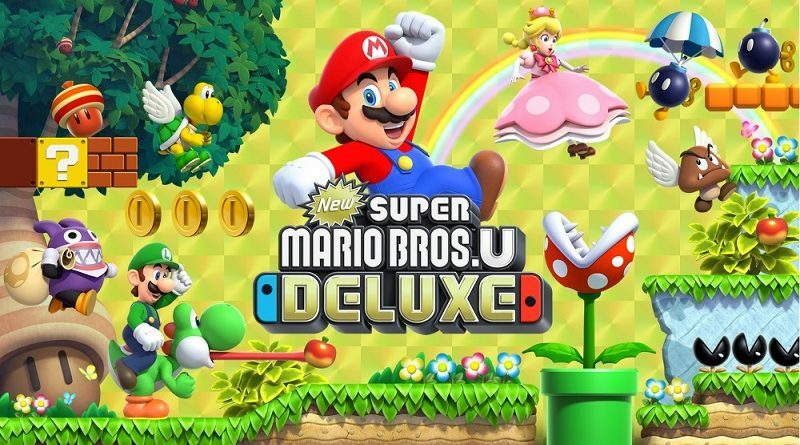 After a good debut, New Super Mario Bros. U Deluxe sold 88 840 units during its second week on the market: a 47% drop compared to launch week. That’s a pretty good drop for a second week (better than the original on Wii U, despite releasing during the holiday season! ), though the game was definitely helped by the public holiday on Monday (but even without it, sales would have remained quite strong). The next few weeks will show us what kind of sales we can expect in the long term. As of this week, 255 143 units have been sold, and the game should reach 300 000 units next week. Super Smash Bros. Ultimate also benefited from the public holiday: it sold 49 533 additional units this week, with a 21% drop Week on Week. As expected, it’s enjoying strong and steady sales despite the end of the holiday season. It looks like it could beat Splatoon 2 to the 3 million units milestone, though it will definitely be close one. As of this week, 2 726 273 units have been sold. There’s quite a few games featuring Mario in the Top 20 provided by Media Create (though there could have been one more: Super Mario Odyssey is out! ), and Super Mario Party is one of them. It’s still enjoying steady sales, with 16 752 additional units sold. This brings the total even closer to the 1 million units milestone, which should be reached during Week 6. As for Mario Kart 8 Deluxe, it looks like didn’t get the memo about the end of the holiday season (though it also benefited from the public holiday on Monday, like the other evergreen titles on Nintendo Switch). It sold 15 062 additional units, bringing the total to 2 085 952 units. If it’s ever going to reach 3 million units LTD, it’s not going to do so any time soon! Meanwhile, Pokémon: Let’s Go, Pikachu! / Let’s Go, Eevee! is holding fairly well, with 12 351 units sold this week according to Media Create (that’s 20% down Week on Week). It’s getting closer to the 1.5 million units milestone, but it’s not quite there yet (it should reach it before the end of this quarter). Unfortunately, Dragon Quest Builders 2 seems to be held back by its high price, because it didn’t really benefit from the public holiday. It sold about 21 000 units this week, once again with the Nintendo Switch version selling the most (11 490 units). Both versions have now sold over 417 000 units combined, with 500 000 units being a possible but quite far target. Minecraft is the last game in the Top 20 from Media Create above the 10 000 units/week milestone, with 11 107 units sold. Sales are very slightly down (-12%), but they bode well for 2019 as a whole. It’s now sold over 573 451 units at retail alone. Finally, Splatoon 2 is (unfortunately) not among the games that sold over 10 000 units this week, though it did come pretty close to that with 9 469 units (-14%). Sales have slowed down in the past few months, so it will be interesting to see how they hold out through 2019… Q1 will be a good indication of what to expect! So far, over 2 900 000 units have been sold, and the 3 million units milestone will be reached in April at the latest. Hardware-wise, the effects of the public holiday on Monday was certainly felt… on the Nintendo Switch side, anyway. Sales slightly dropped this week, with 71 139 units sold (as opposed to 78 056 units during the previous week). That’s a pretty good performance, though unfortunately, sales are expected to drop again next week (and the drop should not be as soft). Of course, that doesn’t spell doom or anything: it’s just to be expected during this season, and without major releases. So far, 2019 sales are looking pretty good for the Nintendo Switch. 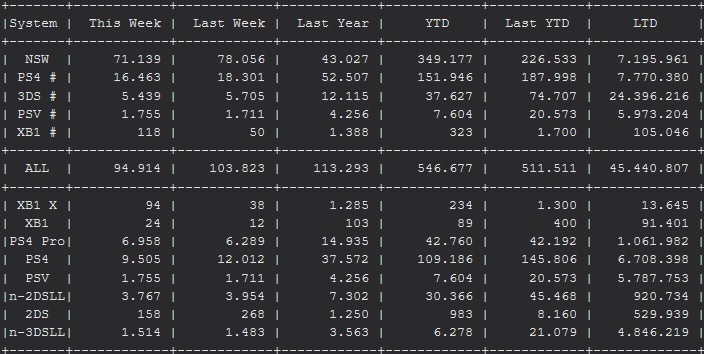 During the same week, last year, Media Create reported only 43 027 units for Nintendo’s console, and so 2019 sees a noticeable improvement. So far, 349 177 Nintendo Switch consoles have been sold in Japan this year, as opposed to 226 533 last year after the same amount of weeks. 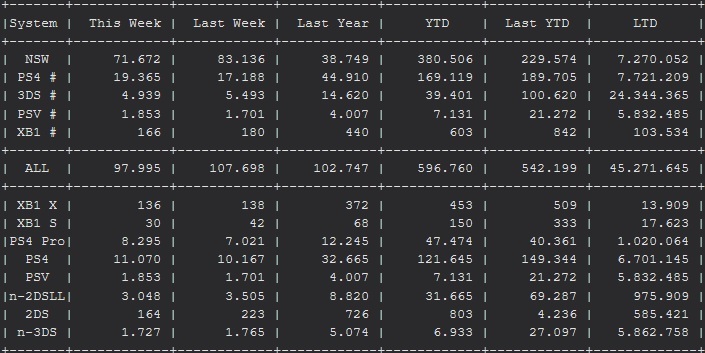 While the next milestone is still quite far away (7 195 961 units LTD), it looks like we can expect the console to reach the first million in 2019 significantly faster than last year. As for the Nintendo 3DS, its sales are perfectly flat with 5 439 units sold (as opposed to 5 705 units the previous week). The public holiday did help a bit, but as expected, there’s no big increase or anything (there wasn’t one for the Nintendo Switch, so it was unlikely there would be one for the Nintendo 3DS). As mentioned before, it’s pretty safe to expect low but steady sales for the Nintendo 3DS this year.